Oh, my. We're so indocumated with everything, and so flusterated and afraid. Don't be afraid. The other night I preached on that, "Be Not Afraid. It is I." The only thing that could help them, they were dying, drowning; Satan was going to take them, and they thought He was a spook--a spirit. The only thing you could help them, and that's the way it is today. The only thing that can deliver you from cancer. It's the only thing that can deliver you from heart trouble. Medicine has no remedies for that. The only thing that can help you is the Thing that you're afraid of, afraid it's a spirit of some kind. 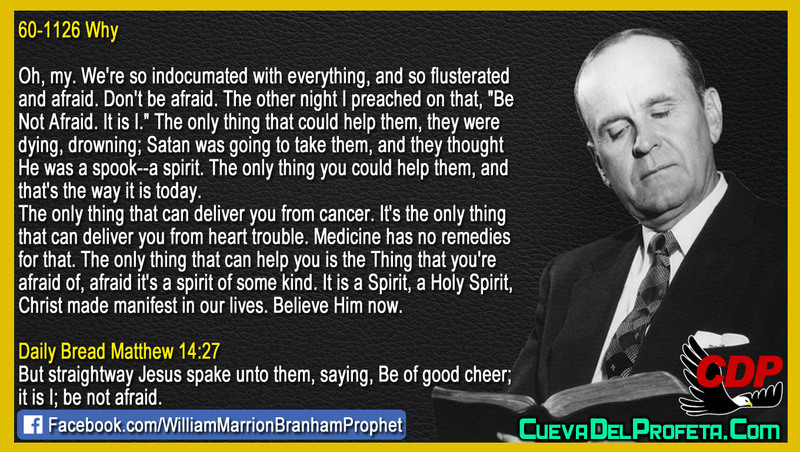 It is a Spirit, a Holy Spirit, Christ made manifest in our lives. Believe Him now.